The chart below shows the number of men and women in further education in Britain in three periods and whether they were studying fulltime or part-time. This is a bar chart of the number of men and women in further education in Britain in three periods. 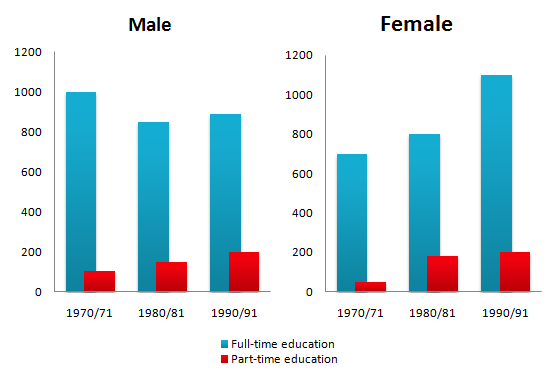 In 1970, Most of Men were studying part-time but from 1980, studying part-time as decreased and studying full-time was increased and in 1990, it was twice as many students as in 1970. On the other hand, Women studying Full-time were increased and not only Full-time, part-time also were increased. In 1990, studying full-time was three times as many students as in 1970. If compare Men and Women, as you see, in 1970, Men were studying more than women full-time or part-time but it changed from 1980 and then, in 1990, Women were studying part-time more than Men and studying full-time was same number. It shows you women has a high education now. According to this graph, the number of men and women in farther education in Britain shows that following pattern. In the case of male, the number of male has declined slightly from about 100 thousands in 1970/71 to about 850 thousands in 1990/91. However, this figure rose back to about 850 thousands in 1990/91 from about 820 thousands in 1980/81. The proportion of full-time education has declined during this period. However, the proportion of part-time education has increased dramatically. On the other hand, in the case of female, the number of both full-time education and part-time education has increased during the period. From about 700 thousands in 1970/71, these figures rose to about 820 thousands in 1980/81, to about 1100 thousands in 1990/91. In terms of full-time education, this figure rose by about 260 to about 900 in 1990/91. On the other hand, with respect to part-time education, this figure rose dramatically between 1980/81 and 1970/71. However this figure rose slightly between 1980/81 and 1990/91.